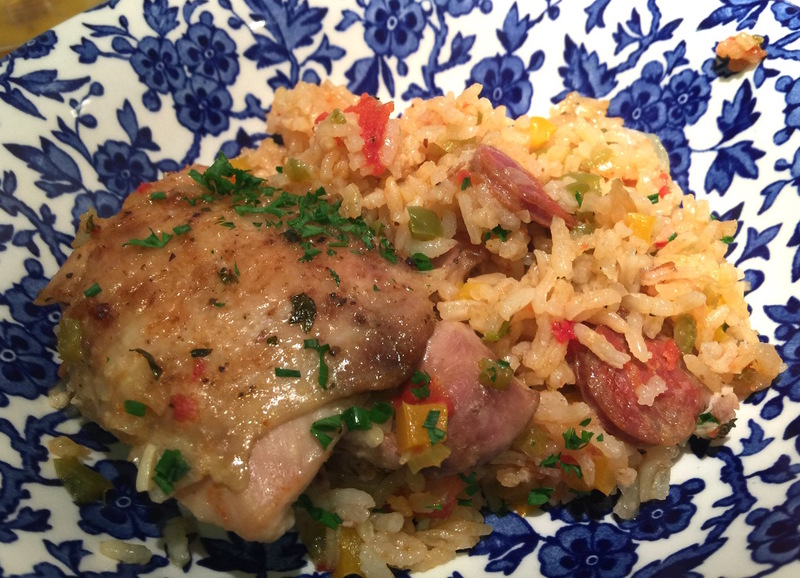 As a family meal, arroz con pollo is as American as meatballs and spaghetti. Or tacos. 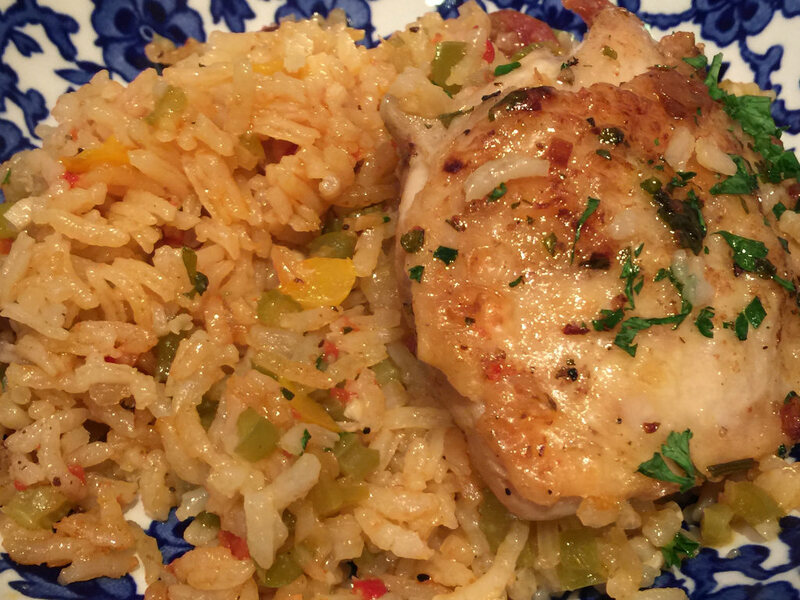 It’s easy to forget about something as basic as arroz con pollo. But when friends came to dinner for Superbowl Sunday I decided to haul out my old baked chicken on rice recipe and do some updating. Yep, I’m talking about a casserole — a one-dish meal. It’s not exactly plain but it’s also not fancy. For me, it’s family style and it turned out to be totally delicious with a big red wine. Thing is, when I started to make the ACP I realized I had given my French copper braiser to our daughter. I gave her most of my copper pans last year because they became too heavy to lift. It’s rare for me to buy a piece of cookware these days. 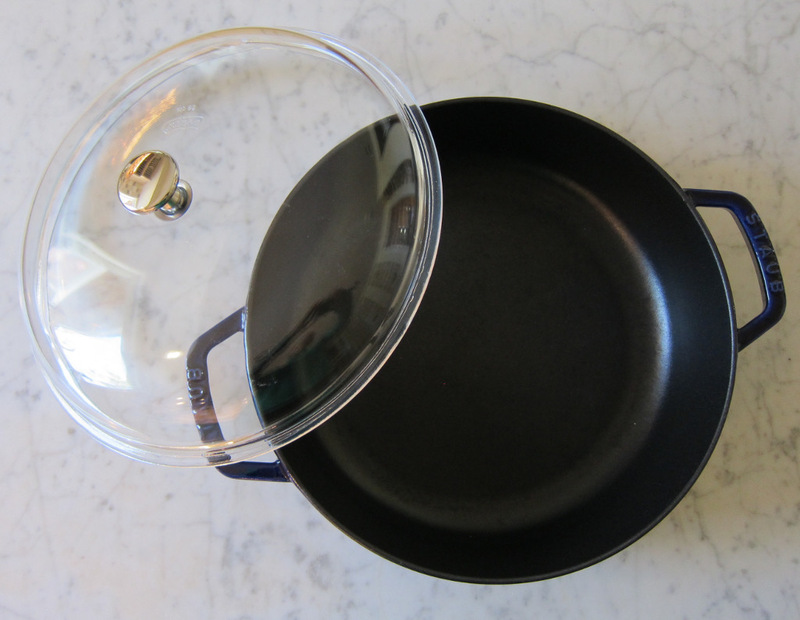 But after some research I fixed on a 4-quart Staub flat-bottom braising pan with a glass lid and a black interior that is good for browning. It was on sale and I was able to beat that price on Ebay, though it wasn’t inexpensive. 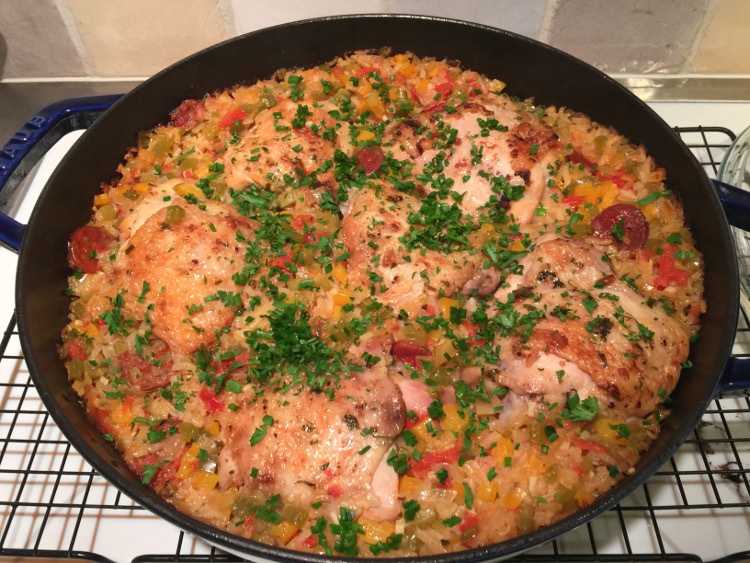 As a stove-to-oven pan the Staub is a perfect choice and it I am pleased to recommend it. Rebecca won’t get this one till I’m gone. Take a look. There are two important aspects of this recipe. First: chorizo. That’s pork sausage, of course. 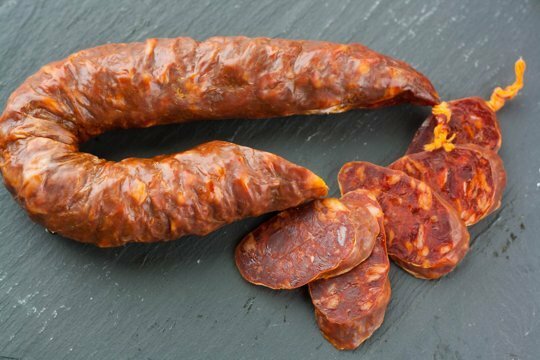 But there is cured Spanish chorizo flavored with smoky paprika (pimentón) that looks like pepperoni and has a similar texture. Chorizo is served for tapas in Spain. I used Spanish chorizo (so delicious!) in this recipe. Then there is Mexican chorizo which is softer and spicier. (Epicurious has a more detailed explanation here.) They are not interchangeable. Be sure to taste the chorizo before starting the recipe and, if necessary, adjust the salt and pepper accordingly. Second: this ACP has deep flavor but isn’t especially spicy. But it can be spiced in a few different ways which I suggest as a garnish. That’s because hot chiles vary a good deal in terms of their heat and will be blunted by the rice. Anyone who wants to spice this up can sprinkle minced jalapeños or serranos over the top along with the parsley and chives, or spoon on Pico de Gallo to taste. There’s always sriracha or my crazy garnish — jalapeño jelly which I grabbed without thinking and was so delicious, especially in big globs on the chicken. ACP is one of those you-can’t-go-wrong recipes. Chicken thighs— with skin on so they brown little, and bone in for flavor — get a light rub with a seasoning paste. All the vegetables are diced and mixed into the rice. And while I’m not someone to go all Masterchef about evenly chopping vegetables, this is a good place to practice knife skills if needed. One last thought. It’s easy to forget that the braiser came out of the oven and can remain hot for a long time. I immediately put pot holders on each side as a safety precaution — a pot holder will be needed to remove the lid as well. The chicken stays hot for a long time and I think it’s even better the next day. Overnight to 2 days ahead: Trim excess fat from chicken thighs and pat dry with paper towels; set aside. Mince garlic together with the salt and pepper until very fine. Transfer garlic mixture to a small bowl with lemon zest, parsley, oregano, paprika and oil. Stir well then rub the mixture lightly all over the chicken thighs. Transfer chicken to an airtight container or bag and refrigerate until cooking time, up to 2 days. 1. Heat 2 tablespoons oil in a 4-qt. ovenproof braiser with lid, or in a Dutch oven. Add 3 chicken thighs skin-side down. Cook over medium heat until chicken is lightly browned on each side. Transfer browned thighs to a sheet of aluminum foil. Repeat to lightly brown remaining chicken thighs on both sides. Reserve any juices that accumulate on the foil. 2. Adjust oven rack to lowest position. Heat oven to 400 F.
3. Pour off all but 2 tablespoons of the oil mixture in the pan into a heatproof bowl; discard. Add 2 tablespoons fresh oil to the pan and reheat. Add garlic and onion and stir over medium heat until softened. Stir in celery, cover and cook over low heat until soft and juicy about 5 minutes, stirring a few times. Uncover, add yellow pepper, green pepper and tomatoes. Cook over medium-low heat until softened, about 5 minutes longer. Stir in salt and ground pepper. 4. Stir in the white wine, scraping to remove any cooked on bits from the bottom of the pan over low heat for a minute or two longer. 5. Stir in the rice, chorizo slices and the broth. Place chicken thighs, skin side up, evenly over the rice mixture. Add any drippings from the foil. Bring liquid to a simmer, cover with the foil touching the top of the chicken, then cover tightly with the lid. Bake for 35 to 40 minutes until chicken juices run clear and rice is tender. 6. Garnish with parsley and chives and serve with or without optional spicy condiments. If Mexican chorizo is a must, the salt and spice level isn’t the only adjustment that may be necessary. It’s likely to be fattier. The rice should absorb it but it’s something to consider. There also is fresh chorizo in bulk or links. That would be need to be cooked and I would do that separately so it doesn’t take over. Blot the pieces well. I used chicken thighs vs a whole chicken because they cook evenly and are easy to serve. I like them skin on so they get a little color and the meat doesn’t become dry. Leaving the bone in adds flavor and because the chicken is soft and well done the bones are easy to remove. That can be helped along by running a sharp knife along each side of the bone on the underside of each thigh. Alternately they can be boned which makes them easier to eat (and may be better for children). Smoky Spanish paprika (pimentón) is something I regularly keep on hand. For me, it’s the only paprika that adds flavor in addition to color. Otherwise, why bother. Chicken can be rubbed up to 2 days in advance. It will gain in flavor. Once it’s browned it should be cooked within the hour. Not a good idea to have partially cooked chicken hanging around. All the vegetables for this can be chopped and bagged a day in advance, or even two days. Once assembled, it needs to go into the hot oven immediately. However, once cooked it can stand at room temperature, covered, and should stay hot for an hour or more. The beauty of the cast iron braisier is that it holds the heat and can go directly on a warming tray or be rewarmed on the stove top if needed. Pimentón - Can use chili powder without salt. It won’t be exactly the same flavor but it’s a small amount. Parsley - Can use chopped cilantro. Chives - Can use sliced scallions. Chicken thighs - Can use 12 drumsticks. White rice - Can use plain long grain in place of basmati or Jasmine, or brown rice (I haven’t tested this with brown rice but expect I’d add 1/2 cup additional broth). Seafood - This isn’t paella. It cooks covered and too long for seafood. If you must have seafood make paella instead. Blue Arden pattern- burleigh manufacturer- sorry for being to quick with hitting post. If your readers are searching for a similar pan,I think i just saw the same (size) pan on sale in an email I received from Williams-Sonoma ($149.95). Found them on ebay. Very fast delivery. I would always check prices with them in the future. This looks so good! I haven’t made Arroz con Pollo in many years, so thanks for reminding me. I do not remember ever using chorizo in it, but probably way back when — I couldn’t get it. I think Sur la Table has that pan, too.